Children love music, love to discover and love to create. after starting formal music training? Most traditional piano lessons focus on reading and perfecting music pieces. While it’s important to read and play music fluently, often times, the technique drills turns into mindless repetition and learning music theory becomes filling out boring worksheets. The whole process stifles creativity. Most children start to HATE practicing and lose the sparkle in their eyes. We believe in your child’s inner musician, natural curiosity and creativity. We teach the ways children learn music. Our curriculum is based on Dr. Edwin Gordon’s lifelong research on how children learn music. The music learning process is similar to the language learning model. Think of how a baby learns language. They listen, speak, then read and write. The ability to speak and improvise fluently on piano helps students become a much stronger reader and composer in the long term. 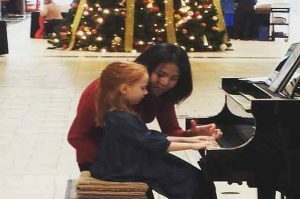 "I watched her become passionate about playing the piano and fall in love with her instrument"
"My daughter is excited to go to piano lesson and enjoys playing the new pieces she learns every week." "I can improvise and think creatively about the music."